It’s fitting that Pokemon’s most significant evolutionary leap in its 20-year history is on a mobile platform, which mirrors its humble origins on the Game Boy. We’re going outside with Pokemon Go, catching Pokemon with friends, fighting over gyms, and making new friends along the way. 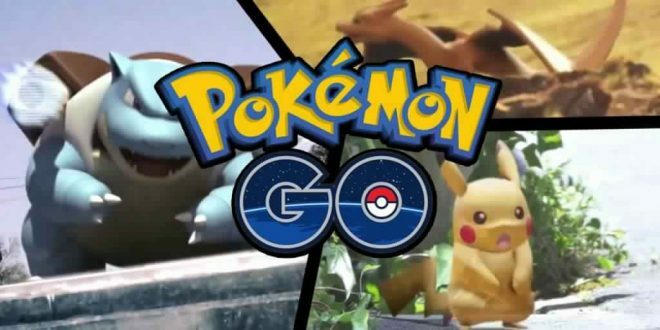 “Pokémon GO” is an augmented reality game based on the venerable Pokémon video game (and card game, and cartoon) franchise. Instead of playing it on a portable Nintendo game console, you play this version on your phone, out in the world. The game’s creators, Niantic, use Google Earth technology to overlay a world of Pokemon onto real world locations. Your mobile phone becomes the lens through which you see this reality plus Pokémon environment. When you find a pokemon, it appears in the world in front of you, ripe for capture if you’re a sure hand with a pokeball. There are 250 different kinds of pocket monsters hiding out there. Your job is to capture them, train them, and use them to claim Pokémon gyms for your team. There’s no way to play the game except to get up, walk around, and try and catch them all. Different types of Pokémon prefer different environments. My neighborhood has lots of bird and rodent types. Go down to the bay or the beach and you’ll find fish and squid and even sea serpents. Capturing Pokémon involves flicking a pokeball at the target on your phone’s screen, not unlike “Angry Birds.” When you have a big enough stable of captured Pokémon, you can take them into battle at any gym location around town. This involves a slightly more complicated system of swiping, tapping, and light strategy, but if you win you can help claim that gym for your team. This is the most difficult part of the game, but it’s very simple compared to the complex systems of the normal, non-augmented reality Pokémon games. The game is free for both Android and Apple phones. You can spend money to buy in-game items to make your poke-catching more efficient. The game doesn’t do a good job of teaching you how to play – you’ll need to go online to the official (or an unofficial) site to really understand what to do. The app chews through battery life at an alarming rate, since you’re using the GPS, the screen, the camera, and the internet connection all at once all the time. In its first week of release it has been very buggy, often crashing, freezing, or just not working when the Niantic servers are overloaded. It works more than it doesn’t work, but it should work much better. It’s likely all these problems will diminish in the coming weeks. I doubt the company was prepared for how popular “Pokémon Go” is – the game will likely surpass Twitter this week in number of active users. That popularity is what makes it fun. On launch day, I was at Ringling College, and nine out of ten students I saw were wandering around campus playing, as was I. Sunday morning when I went down to Bayfront Park to catch some Tentacools and Magikarps I met a trio of fellow players with their phones out. “Catch anything good?” I asked. All three burst out laughing and we exchanged friendly banter about where to find Psyducks and if anyone had had any luck catching the Dragonair (it was too tough, none of us could). While waiting for a sandwich at Mozzarella Fella, I told the man behind the counter that I would be right back – I was going to go catch some Pokémon while my chicken parm was cooking. He laughed, but when I came back he and one of the others were talking about it and getting ready to load it on their phones too. That’s why now is the time to try it. Pokémon is such a popular franchise and many might still be playing it a year from now, but it won’t be as ubiquitous as it is at this moment. There will probably never be a better time to play than in the next couple months. It’s free, fun, weird, and something new. Give it a try!